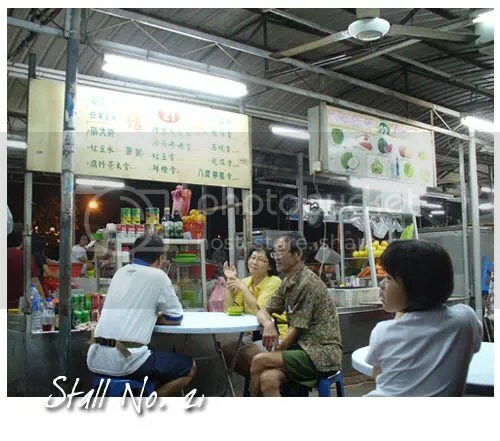 Rediscovered: Egg Popiah & Mo Mo Cha Cha | Ipoh Mali Talak Sombong! 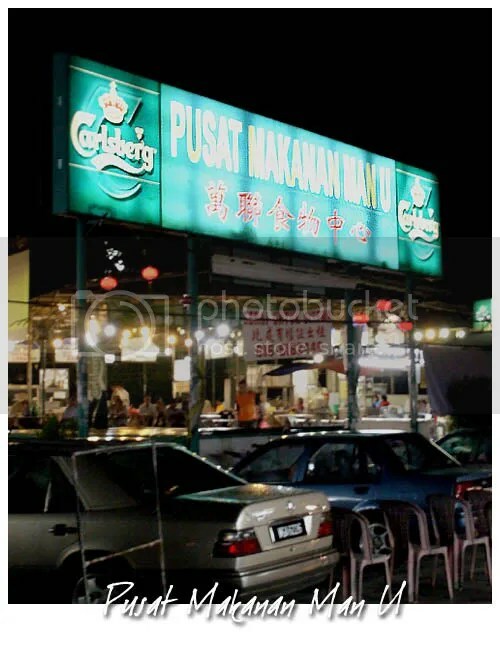 This entry was posted in Food (Ipoh), Type: Dessert, Type: Hawker Fare by Jason. Bookmark the permalink. wah … your last pic was a gorgeous shot. so rare to find good Mixed Ice. the one in Woolley very farny one. they stack them all in a small, tiny bowl. Then when you scoop them, the whole thing falls over. guess they’re obssessed with Uno Stacko? J2Kfm: Ugh, I hate it when my food falls over. Shall not order this at Woolley. Wmw rave about it, you rave about it, so no matter how much i don’t like turnip, i will give it a try! 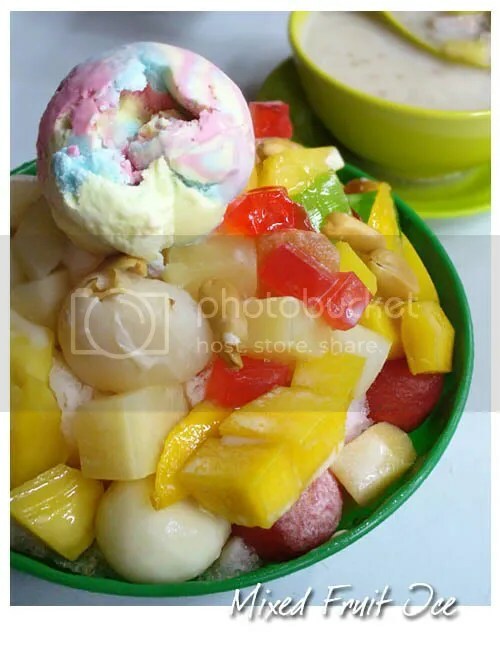 OMG and you shaved ice with fruits looks sooo refreshing! And topped with my fav Paddle Pop Rainbow flavoured icecream. Jieng!! love that colorful icecream.. when i was little, i use to hope eating icecream that color would turn my tongue into a rainbow.. permanantly.. hahahah..
oh.. btw, love the header photo.. u changed it rite?! Precious Pea: Aww… so sweet of you. =) When lah is our Ipoh trip by the way? Faster plan then we can go have the ice with Paddle Pop Rainbow ice cream! Cumi&Ciki: Hahahaha… when we were little, we don’t know what is dangerous but now, if that colour will permanently stuck on the tongue, we’ll freaked out. Such bliss to be a kid isn’t it? Yeah, I think the old one is kinda boring, so I changed it. What a good timing. I mayb passing thru Ipoh this wkend. Thx for the reminder. Wow… popiah. I really must go to Ipoh to try the food ler. Somemore I’m so crazy over popiah and that definitely looks really delicious. Ipoh have so many nice food & the mix fruit ice make me salivating!! another msian all time favourite! Tummythoz: Hope you did drop by there. 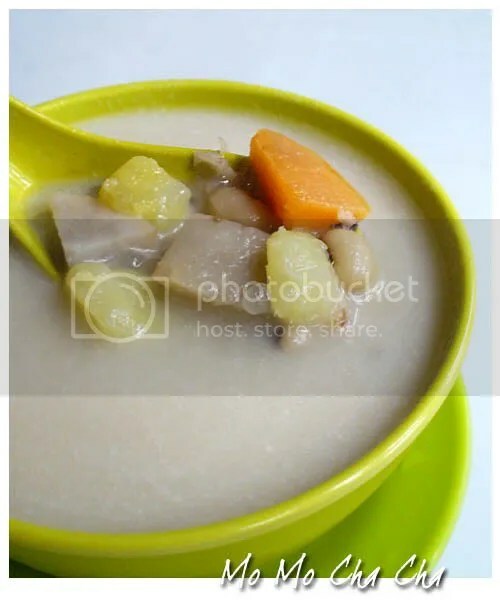 Mimi: That is one of my favourite drink/dessert after ais kacang. Ai Wei: My all time favourite too. WMW: Em… end of November? Change of plans. V went south pulak. Next time! I like the old town snap shot, so rustic and gorgeous, yet so well captured . . a scene which may face out in no time. 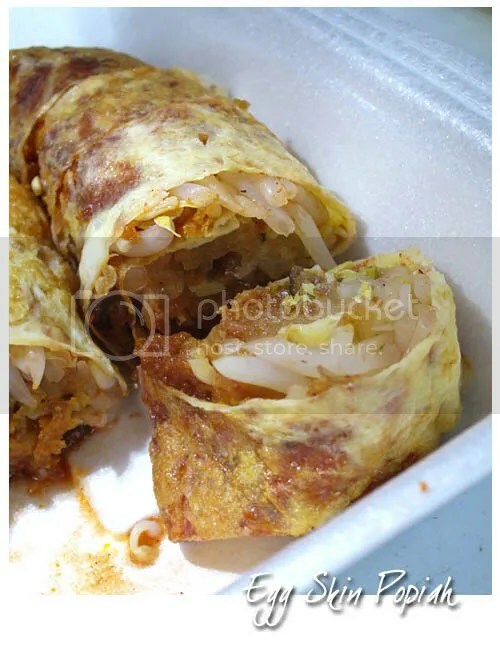 back to egg skin popiah looks awesome, more fragrant compare to to does normal ones. 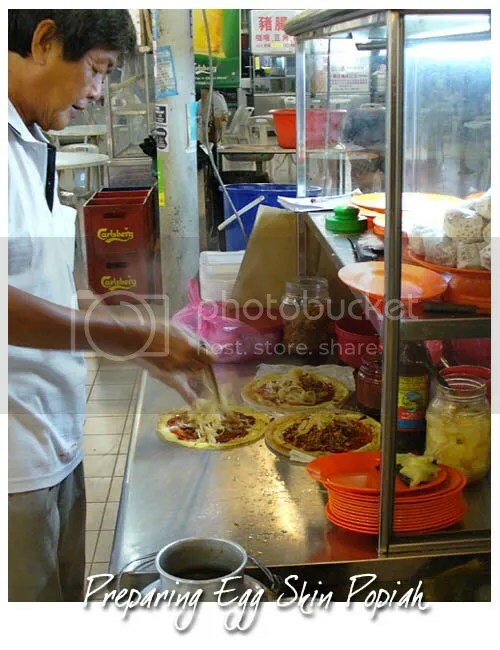 There’s also a popiah stall in Say Huat Restaurant Section 17, PJ that sells egg skin popiah. 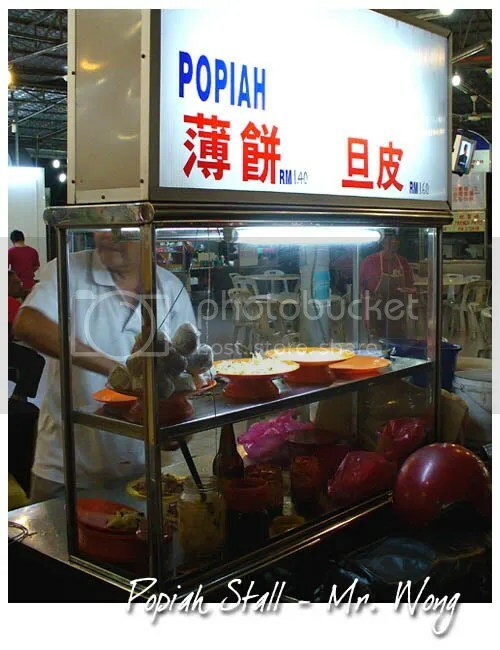 I’m craving for the popiah madly! Really appreciative of this post featuring my comfort food when I was young. It looks much more richer and expensive. The common kin jai fun (economy fried noodles) I supposed are nowhere to be seen. I will eat it for old times sake! Remember the old Tong Sui area where there was plentiful of swifts hanging onto the electrical wires. Tummythoz: Ack! Okay, next time. BBO: Yeah, this version is more fragrant but ate too much will make you feel jelak. Best to share it. Jun: Yeah, it’s just in front of sam tet primary school. Simon: Oooo… thanks for the info, Simon! Christine: Hey girl, when are you coming back? Diane: Hi Diane, thanks for dropping by. Yeah, I’ve been to Indulgence before and after they moved but the quality seems to have dropped. We love the ambiance though, especially the couch! Chin: Oh yes, and the people were very careful that those birds might drop something from above.. haha. I don’t think there’s any economy fried noodles there anymore. I thought they were gonna close down Tong Sui Kai as reported in the papers early of the year or something? Gosh, I miss Ipoh food! YilingL: The place is still operating as usual until now.